Hello friends, it is so good to be back! Hope everyone enjoyed the last blog post featuring His Quarters AKA Hutsy. He did such an amazing job, I wanted to say a quick thank you to hubby for writing a great post and also thank my readers for their wonderful feedback. Now without further ado, let’s return you to your regularly scheduled programming. Year after year I find that my skin gets a little dull and lackluster during the change of season. It is time to bid adieu to dry skin and add some extra replenishing products to my beauty routine. Perfect Spring skin is now only a few products away thanks to Biome. I have been trialing their Dry Mature Skin Pack which is perfect for me right now! The three products in the set include: 3-in-1 Skin Trio Purple Clay & Hibiscus, 100% Pure Rose Hydrosol, and 100% Pure Rosehip Oil. 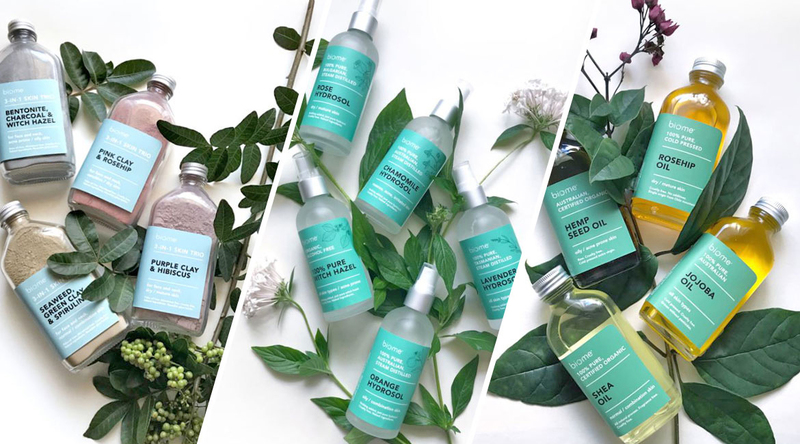 The best part is they’re made with pure ingredients and packaged in reusable glass bottles, thumbs up for responsible zero waste beauty packaging. I also love that we can mix and match these products for our skincare needs. I’ve been combining them for many uses such as to cleanse, exfoliate, tone, moisturise and make my favourite face mask! preservatives, synthetic fragrances, and palm oil. 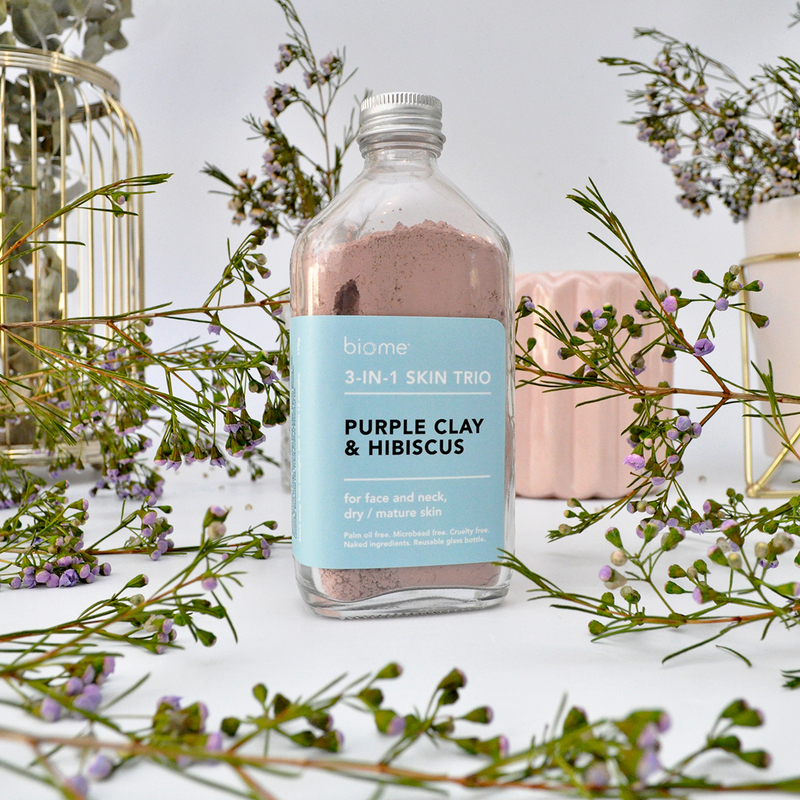 This special hand-blended recipe is made with nature’s finest purple Brazilian clay, fine pumice, hibiscus powder, and essential oils. Formulated to assist with purifying, deep cleansing, smoothing and brightening the skin. How to use: (Weekly Mask) Mix 1 tablespoon of powder with 2 teaspoons of rosehip oil. Apply and leave for 10 minutes then rinse. (Daily Cleanse) Mix 1 teaspoon of powder with 1 teaspoon of unscented liquid castile soap. Wash then rinse. (As Needed Exfoliate) Mix 1 tablespoon of powder with 2 teaspoons of rose hydrosol. Gently scrub then rinse. Follow all steps with a light spritz to the face with rose hydrosol to lock in moisture, tone, and hydrate. I have been using this beautiful floral water facial mist to replenish my skin, keeping it nourished, plump and hydrated. There’s nothing added, just pure steam distilled rose hydrosol from the Bulgarian valley of roses. It is created with fresh roses which are steam distilled as part of the process of extracting pure rose essential oil. I like to use it in combination with the Purple Clay & Hibiscus to create a luxe purifying mask, as well as spraying my skin generously before applying the Rosehip Oil to help it absorb into my skin. How to use: (Exfoliate) Mix 1 tablespoon of Purple Clay & Hibiscus with 2 teaspoons of Rose Hydrosol. Gently scrub then rinse. (Tone) Lightly spritz the face following a mask or cleansing with the Rose Hydrosol to lock in moisture and tone. (Makeup) Help your makeup look dewy and natural while keeping it in place all day by misting the face after your makeup is done! 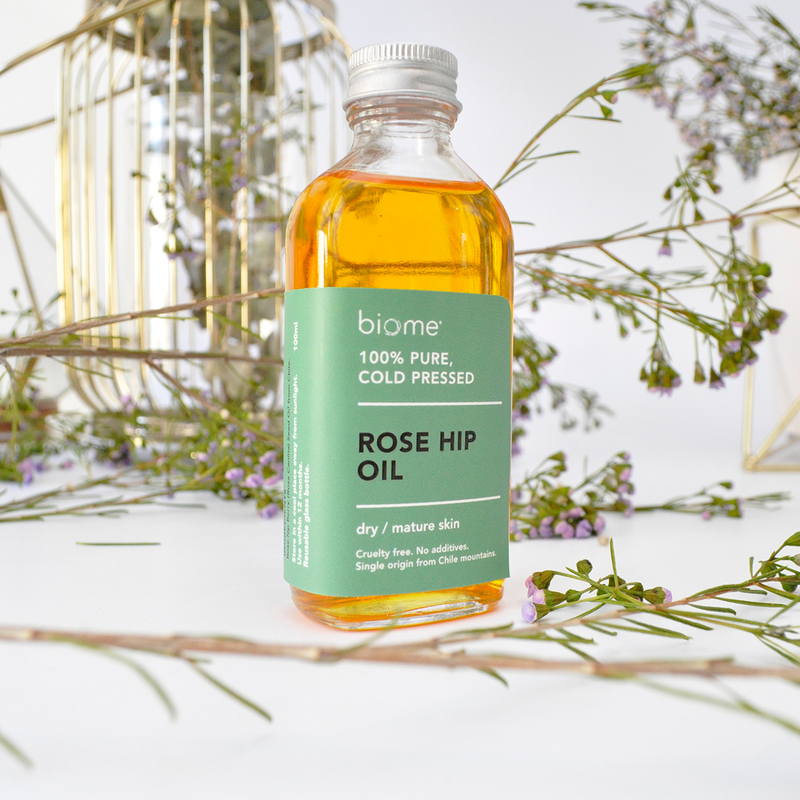 Biome’s pure cold pressed Rosehip oil is the ultimate moisturiser delivering countless health benefits. The different ways to multi-task with Rosehip oil include: Eye makeup remover. Hair serum for dry and split ends. Alleviates cradle cap for babies. Scar healing for both people and animals. Healing dry hands and elbows and cracked heels. Relieving burns and sunburn. Sometimes I like to add a few drops to my favourite moisturiser for or an added dose of moisture. How to use: (Weekly Mask) Mix 2 teaspoons of rosehip oil with 1 tablespoon of Purple Clay & Hibiscus. Apply and leave for 10 minutes then rinse. 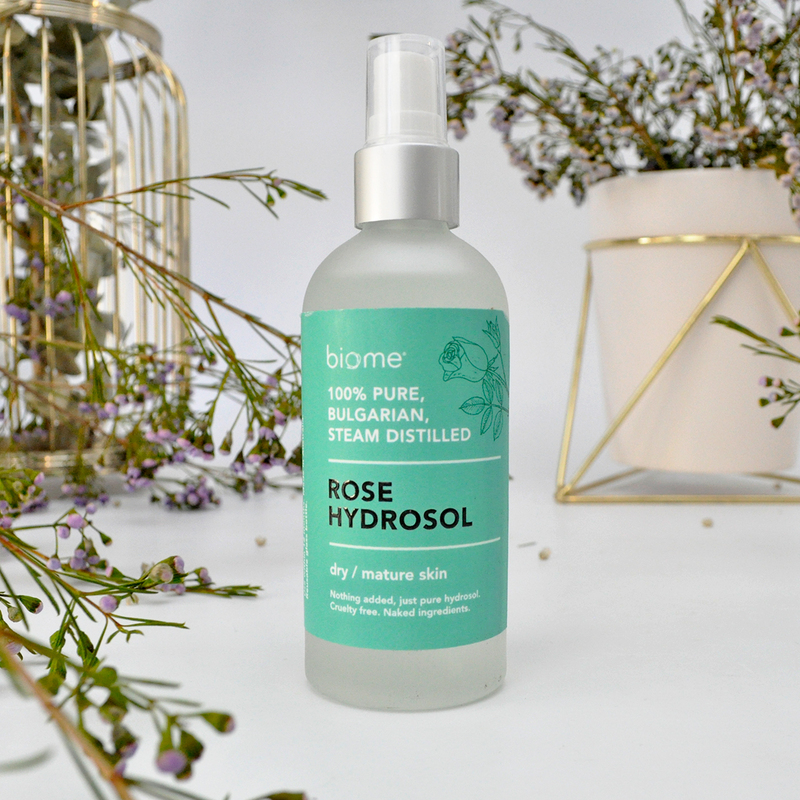 Follow with a spritz of Biome 100% Pure Rose Hydrosol to tone and hydrate the skin. Biome’s zero waste Australian made skincare range is formulated with 100 percent plant, ocean and earth ingredients. 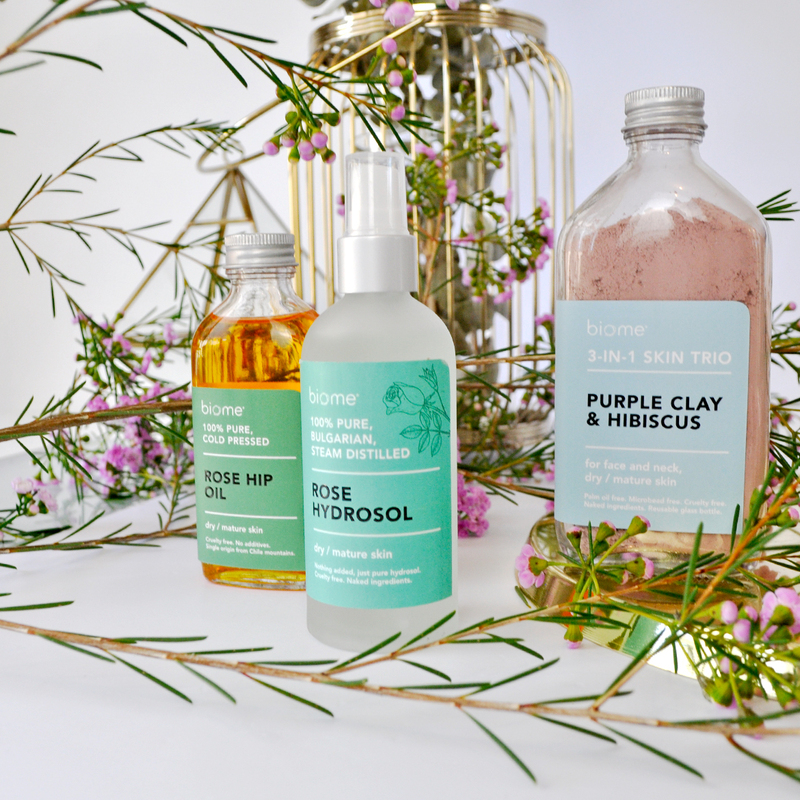 Price: Biome Dry Mature Skin Pack | $95.00 AUD – Click here for more information about the Biome Skin Care range. 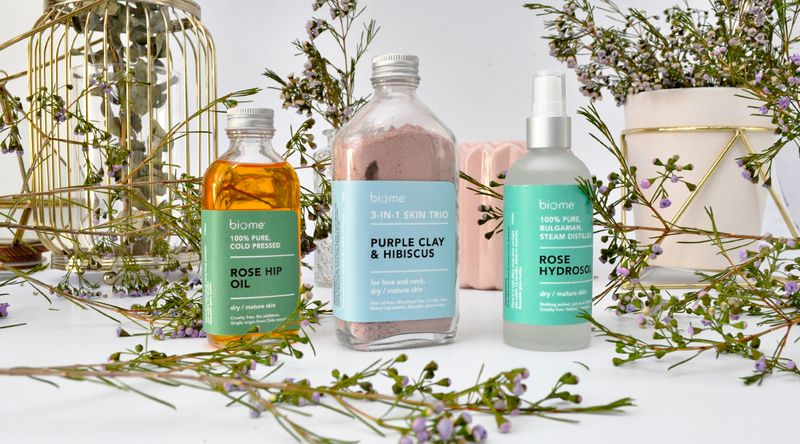 What are your thoughts on Biome’s natural skincare range? Let me know in the comments below! These products sound perfect for my dry, mature skin! Its sounds so good! Its great that you can mix and match and its probably keeping it fresher. My only question is, does it make it hard to dispense the rosehip oil without a dropper? So good! I could imagine myself making a mess. Then again there’s no such thing as too much rosehip oil. Haven’t heard of this brand before, but sounds lovely! The packaging is great too, super simplistic! I love how you can repurpose the packaging! Anything to reduce the waste burden of cosmetics is a plus! I have some of their products sitting to try and I can’t wait! 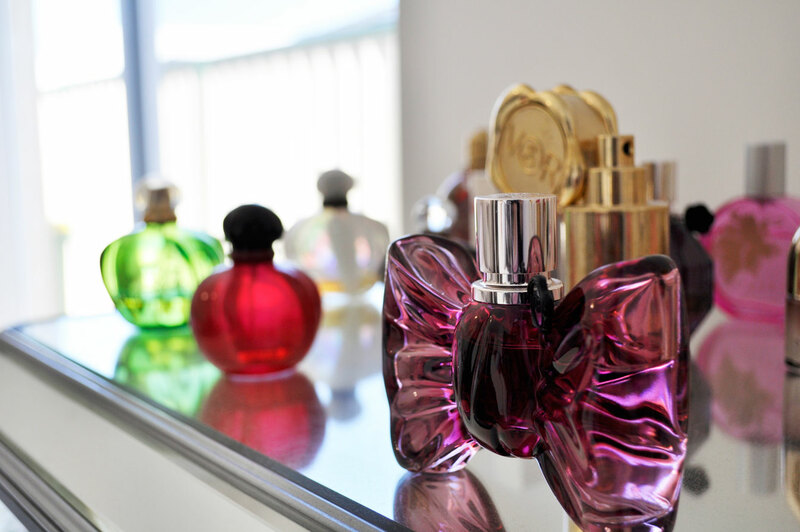 I love how simple the packaging looks, it is so classic.